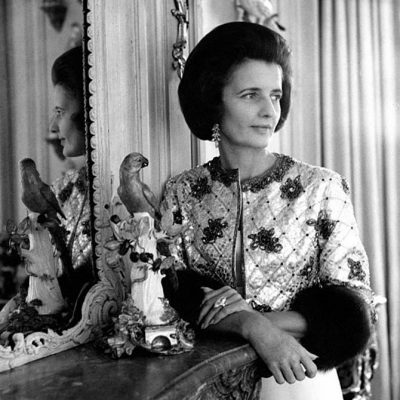 There were no oysters on the half shell or champagne being served in the halls of the Metropolitan Pavillion in Chelsea neighborhood of New York City, during the Antique Jewelry & Watch Show. Not at all. There is nothing like the luxurious set up or culinary treats offered at the deluxe presentations such as TEFAF at the Park Avenue Armory on the Upper Eastside. I made my first foray to the show on Friday afternoon, expecting to stay for an hour. I stayed for three and I wasn’t alone. There were lots of contemporary jewelry designers shopping for inspiration pieces. Archivists, the people in charge of the Heritage collections, from some of the biggest brands in the business were also there. 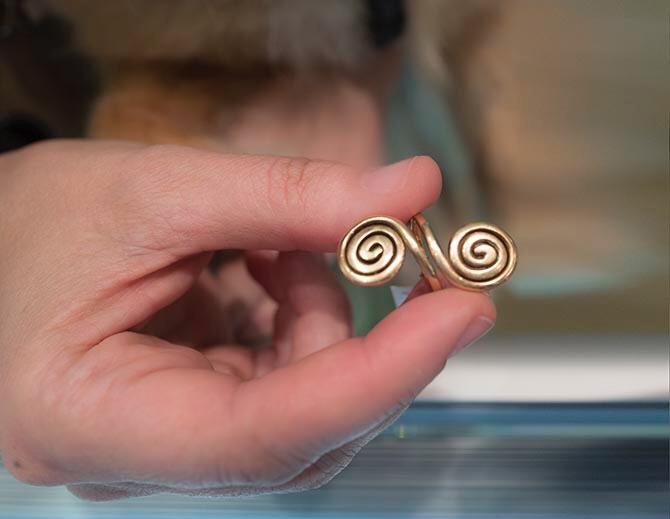 I went back again on Sunday and spent another three hours at the show and brought my photographer Sally Davies so she could snap a few pieces and show the variety of jewelry at the event. Following is a very small sample of the huge array. Oh, and the Antique Jewelry & Watch Show is open to the public. Check the website and mark your calendar for the next time the exhibit is staged. It has dates in Miami and Las Vegas as well as New York. 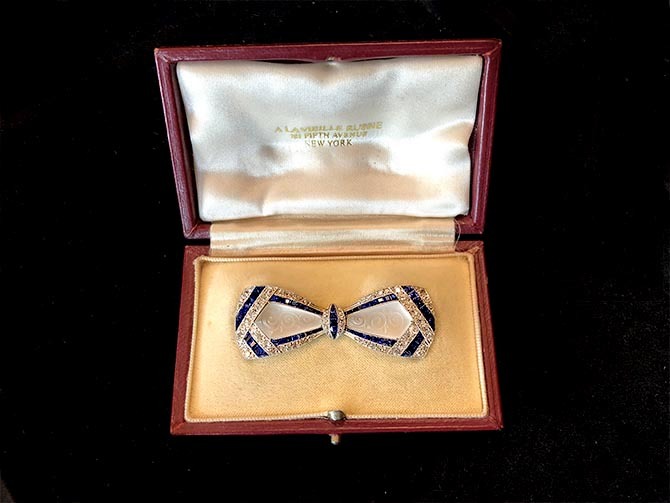 An Art Deco bracelet by Marcus spotted at the magnificent Faerber Collection. 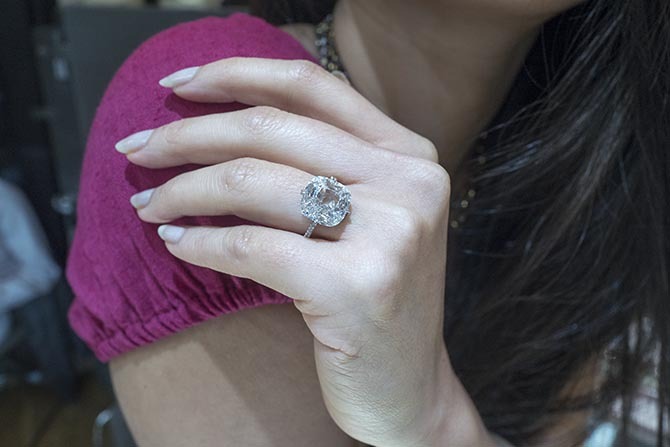 The esteemed jeweler with offices in Geneva, Antwerp, New York, Paris and Hong Kong is one of several at the show who does not have an Instagram account. In other words you have to go in real life to see the treasures. 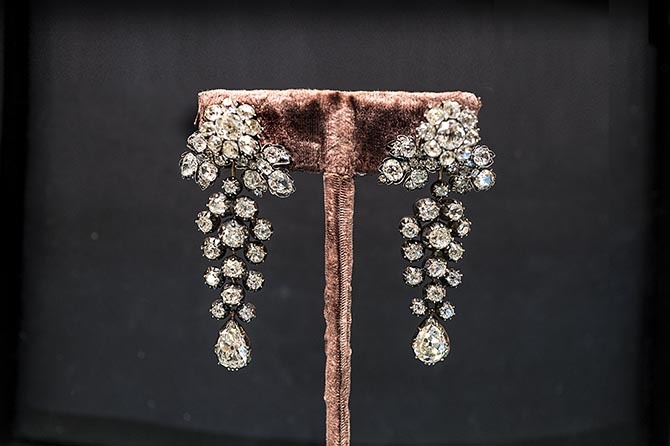 These antique earrings with 21-carats of diamonds mounted in silver topped gold from the Faerber Collection were made around 1890. 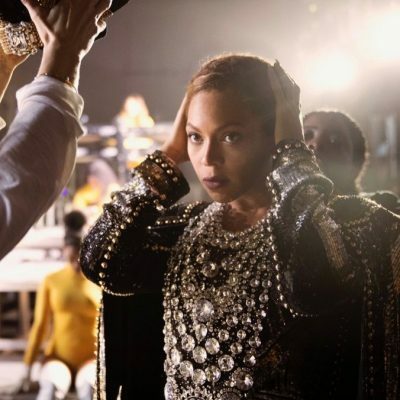 The bottom of the jewels can be removed and the tops worn as studs. The multiple parts of the earrings, the experts at Faerber explained, most likely came from a larger piece of jewelry. 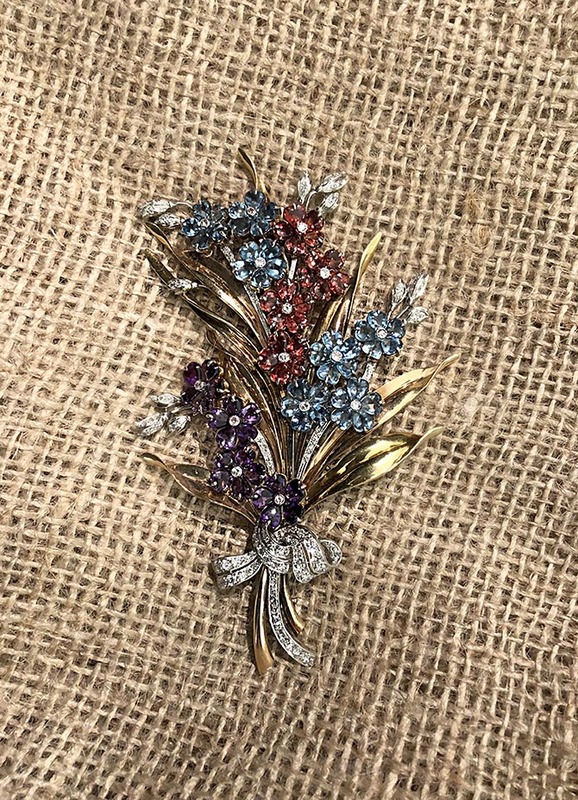 The name of Nicholas Silver’s London based company is 21st Century Jewels, but his inventory is in fact loaded with vintage treasures from the last century. A real jeweler’s jewel in the collection was the gold spiral ring by Boivin, held sideways in the picture above. It doesn’t have any gems, it’s just a lyrical piece that conjures up the daring designs and innovation of one of the most beloved names in jewelry. Created in the 1930s, the design predates Calder. It shows how Boivin was making fluid pieces in a world, when most were making geometric Art Deco designs. Everything, but everything in the display at Simon Teakle is divine and exceptionally curated. 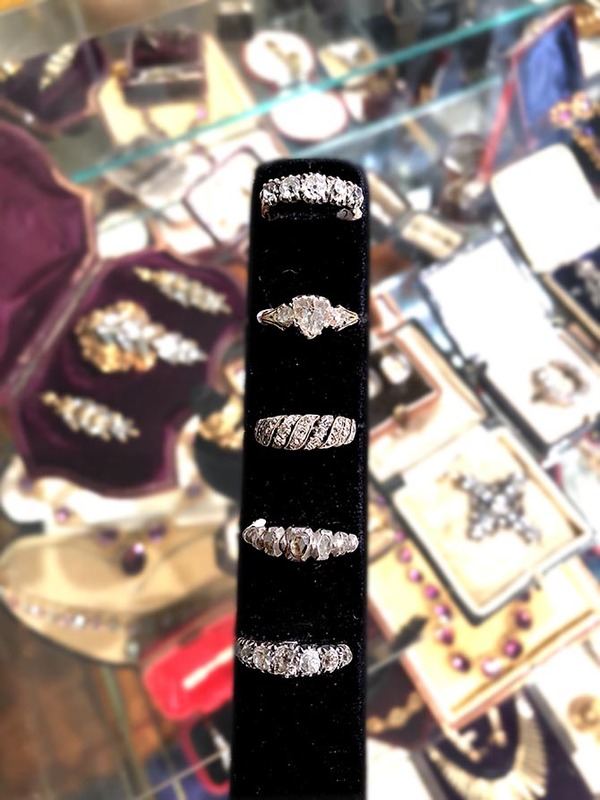 And there is always a wonderful variety of styles ranging from antique to a gorgeous diamond ring like the 5.04-carat H color Flawless stone above. 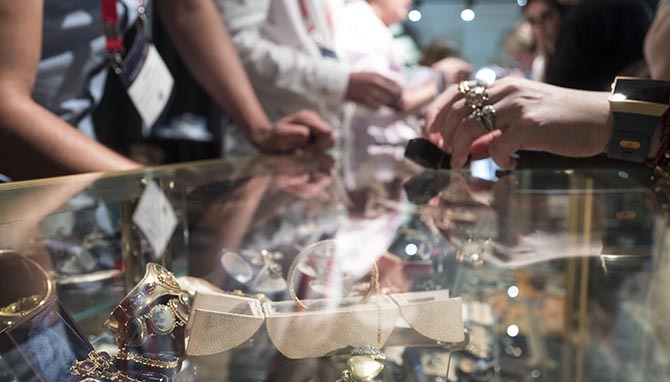 Simon spent 20-years as the head of the jewelry department at Christie’s in New York and he knows good jewelry, all the history and is just a lot of fun to see at any jewelry show. 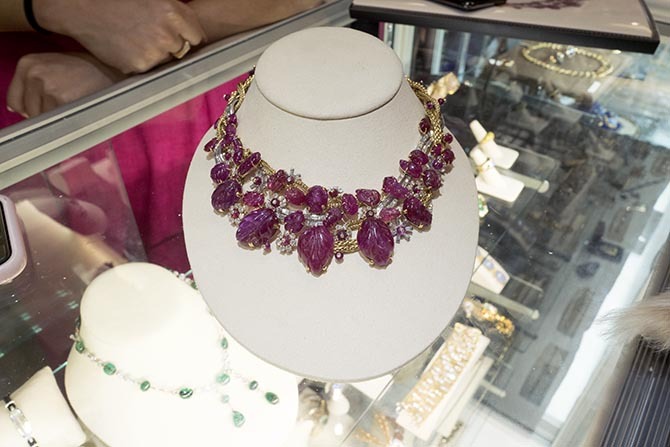 The carved ruby and diamond necklace at Simon Teakle’s booth was made by Marchak, a Russian jeweler who moved to Paris after the the Revolution. Created in the mid-20th century, the design is a splashy mixed of carved rubies, diamonds and gold chain. 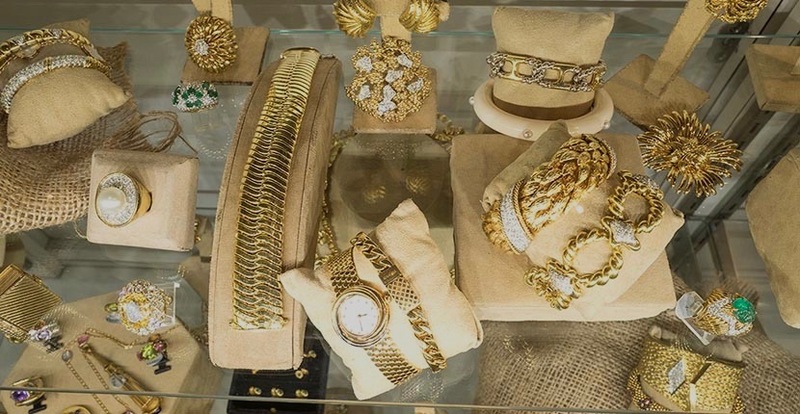 Eric Originals & Antiques Ltd. is one of the most beloved destinations in the jewelry district on 47th Street in New York City. Originally a jewelry designer, Eric turned his talents to retail after he fell in love with a Cartier piece in 1978. The vast inventory at Eric Originals includes, well, just about everything you can imagine. 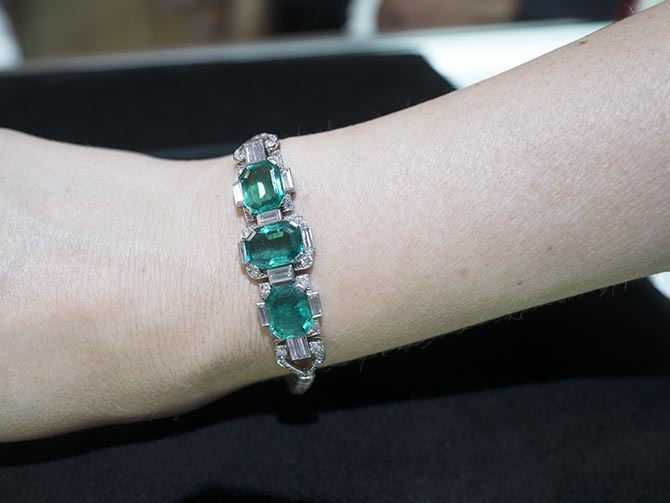 My favorite piece in his collection at the Antiques show was the amazing Art Deco bracelet in the photo above. If you are wondering if the trend for aquamarine and diamond rings like the piece Prince Harry gave Meghan Markle is still rolling, it is. 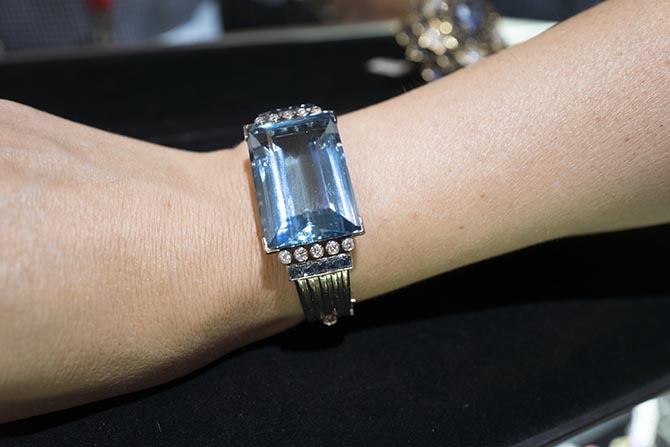 There were aquamarine rings all over the Antiques Show. Eric Originals had a full tray of them. 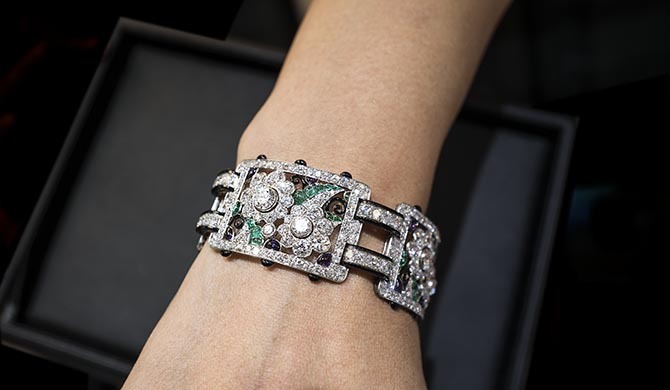 He also had a bracelet with diamonds and sapphires that was a divine variation on the look. 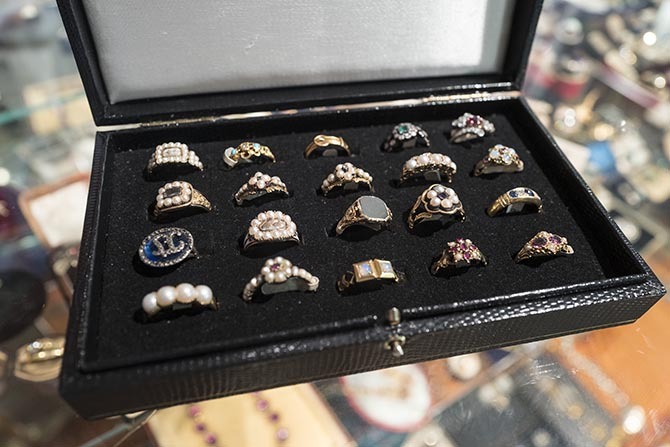 Camilla Dietz Bergeron Ltd. is one of the anchor vintage jewelry dealers at the Antiques show. 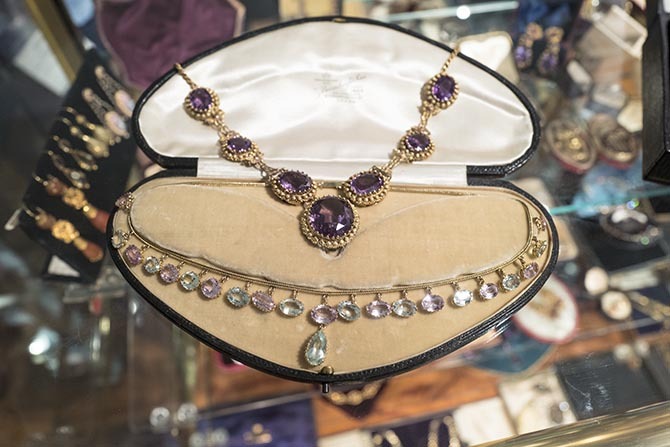 The inventory that is overseen by Gus Davis has bold twentieth century jewels. The crew that works the counter and Gus’ dog Francesca, who is a star of the firm’s Instagram make it a joy to review the collection. One of the most popular booths at the Antiques show is Pat Novissimo’s Lowther Antiques. The Portobello Road dealer has wearable, affordable antiques that are what so many women want right now. It was hard to actually even reach her counter or have a few words with Pat because there was perpetually a crowd around her buying up the goods as fast as she could write the orders. The antique necklaces from Ismael Khan’s Ishy Antiques, who assists working the crowds the Lowther Antiques booth, were just the kind of jewels that kept the people happily ensconced at the cases.